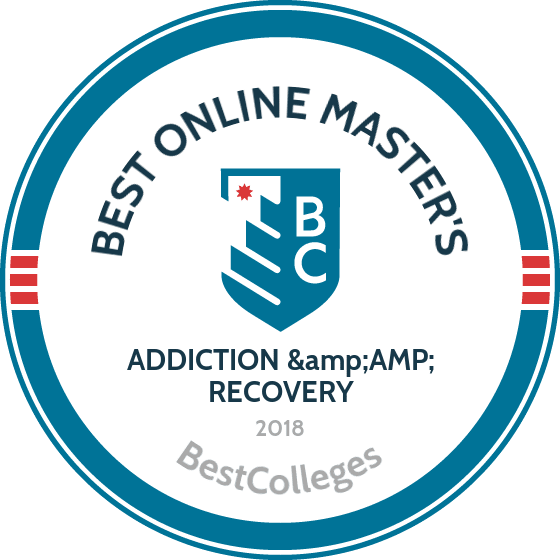 What Are The Best Online Master's in Addiction & Recovery Programs? What Else Can I Expect From an Online Master's in Addiction & Recovery Program? Online master's in addiction and recovery programs prepare students to help people suffering from substance abuse and addictive behavior. The Bureau of Labor Statistics predicts that job growth for substance abuse and behavioral disorder counselors will be 22% between 2014 and 2024, which is much faster than average. This expected industry growth is partially attributable to the fact that insurance companies are covering addiction treatment more than they have in the past. Additionally, more people are seeking help as addiction loses the stigma it held previously. Use the following guide to identify the best online master's degree in addiction and recovery programs. Yes. The best online master's in addiction and recovery programs give students tangible skills that lead to career advancement. You'll leave the program with in-depth understanding of how to identify, prevent, and treat substance abuse and addictive behavior. These skills are in demand for counseling and management jobs in addiction treatment centers. You'll also gain skills in program design, implementation, and evaluation that are needed for higher-level research, education, and public health positions. No. Most online master's in addiction and recovery programs don't require previous work experience. However, if you do have experience in the field you're more likely to be admitted and possibly receive scholarships or grants. Finding the right online program requires you to identify the program traits that are most important to you. When selecting a program you should consider program length, cost, types of courses, instructors, specializations/concentrations, accreditation status, and internship/practicum requirements. CAN I WORK WHILE I COMPLETE MY ONLINE MASTER'S in ADDICTION & RECOVERY? Yes. One of the benefits of pursuing a master's in addiction and recovery online is that you can work while completing your degree. Although you must meet deadlines set by your instructors, online courses allow you the flexibility to study when and where it is most convenient for you. That could be in the evenings after work or in the early morning before your kids wake up for the day. Governors State University's hybrid master's in addiction counseling program is specially designed to accommodate the needs of working professionals seeking to upgrade their scholastic qualifications. The program uses a blended format, enabling students to complete most of the 60 credit-hour requirements online while incorporating traditional face-to-face, classroom-based learning. GSU's graduate addiction counseling program has a strong focus on evidence-based practices and helps students built the necessary skills to improve patient outcomes in clinical settings. Given that addiction frequently co-occurs with anxiety, bipolar disorder, depression, and post-traumatic stress disorder, students also receive enriched training in these subject areas to build the academic requirements needed to achieve universally recognized professional certifications. Transfer students also benefit from GSU's relatively open and inclusive transfer credit program, and the school has the lowest tuition rates in the state of Illinois. Founded in 1838 as the medical school of Hampden-Sydney College, Richmond-based Virginia Commonwealth University features an International Program in Addiction Studies that leads to a Master of Science degree. The program is entirely online, with a flexible schedule that permits full-time or part-time learning. This internationally renowned program benefits from collaboration arrangements with other prestigious institutions around the world, including King's College London and Australia's University of Adelaide. Students complete a minimum of 36 credit-hours, exploring prevalent issues in addiction science including comparative international policy analysis, reviews of international treatment practices, and the effective design and implementation of patient-specific recovery programs. Experimental treatment approaches are also covered in detail, leading students to advanced understandings of the addiction cycle to support professional-level problem-solving, recovery program design, and written communication skills. The VCU program also emphasizes the importance of up-to-date data analysis and welcomes students from international backgrounds. Students seeking to complete a master's degree in addiction counseling online at a Christian institution are invited to consider Indiana Wesleyan University's program. The school offers an online Master of Arts in Clinical Addictions Counseling, which instills students with the clinical skills needed to help patients overcome drug and alcohol addictions in the context of a Christian worldview. Graduates of the program qualify for both state and national licensure requirements. The master's degree program in addiction counseling is aligned with the NAADAC Minority Fellowship Program. The fellowship is designed to improve access to academic programs for vocational counselors intending to serve young members of the nation's minority and underserved populations. Qualified applicants in the final year of the program may be eligible to receive significant levels of financial aid. The clinical supervisors who lead classes are drawn from diverse backgrounds and include men and women who hold PhD degrees and have extensive professional experience. Students can complete coursework entirely online or participate in a blended format that includes classes at the school's Marion or West Indianapolis campuses. Equipped with an M.A. degree in human services with a concentration in addiction counseling, Regent University graduates can leverage a faith-based education to serve the needs of those struggling with substance abuse. In all, students take 30 credits and typically graduate within two years. This respected master's degree in addiction counseling online program involves a combination of real-time instruction, group projects, chat room discussions, and podcast-based lectures. All coursework is delivered through the lens of a Christian worldview. Students also must engage in 150 hours of approved field experience working with established professionals. A capstone course completes the program and incorporates what students have learned in class and through field experience. Regent University's campus is located in Virginia Beach, Virginia. The school is regionally accredited by the Southern Association of Colleges and Schools Commission on Colleges. The University of South Dakota offers learners academic opportunities on a picturesque campus in Vermillion. USD administers a suite of online degrees for nontraditional learners. Students in the 33-45 credit master of arts in addiction studies program learn at an institution regarded as a leader in addiction and prevention education. The program, accredited by the National Addiction Studies Accreditation Commission, remains one of eight in the nation and offers regular and advanced tracks. The curriculum covers addiction studies research, addiction counseling, alcohol and drug counseling theories, alcohol and drug treatment continuum, and wellness recovery and maintenance. Students take an internship that requires supervised field experiences. Learners in the online master's degree in addiction counseling consistently score above the national average on state certification exams. Students take the program completely online in an asynchronous format. Learners pay one tuition regardless of in-state or out-of-state residency. Admission requirements include a bachelor's degree, school transcripts, and a criminal background check. Online master's degree in addiction and recovery programs train students to provide treatment, counseling, and support to people in recovery from addiction. Many programs prepare graduates to sit for state-specific exams required to become a licensed counselor. Details of what to expect when pursuing an online master's in addiction and recovery may vary depending on school and program. Online master's degree programs in addiction and recovery offer different types of courses depending on the school you choose to attend. Some programs focus on academic theories of addiction, treatment, and recovery, while others spend more time developing students' clinical skills. Below you'll find a sample curriculum for a master's in addiction and recovery online degree program. Group Therapy in Addiction Treatment: Students learn to facilitate group therapy sessions for people in treatment for substance abuse and addictive behavior. Skills learned include active listening, observation of individual behavior and group interactions, facilitation, leadership styles, problematic client behavior, and evaluation. At the end of the course, students will know how to develop, facilitate, monitor, assist, and evaluate a small group undergoing addiction treatment. This course prepares students to work as counselors in recovery/rehabilitation centers. Introduction to Addictive Disorders: Students get an introduction to the nature of addiction and how it impacts individuals suffering from it. Topics covered include identification, prevention, and treatment of substance abuse and other addictive disorders. Current research and historical approaches to addiction are discussed. This introductory course prepares students for any type of job related to addiction, including counseling, research, and education. Practicum in Substance Abuse Counseling: Students receive hands-on, real-world experience counseling people with substance abuse issues and addictive behavior. Students are placed in a field experience and learn from a supervisor with direct experience in substance abuse counseling. Activities may include monitoring and evaluating clients/patients. This course prepares students to work as substance abuse counselors. HOW LONG DOES IT TAKE TO GET AN ONLINE MASTER'S IN ADDICTION & RECOVERY? To determine how long it will take you to get an online master's in addiction and recovery, you'll need to consider your individual situation. Will you be working while attending school? Will you be taking classes part time or full time? The number of courses you take each term will affect how quickly you can graduate. The school's academic calendar and schedule may also impact how long it takes you to complete your degree. Some schools deliver courses year-round, while others only offer classes during two semesters each year. Some programs permit students to progress through the curriculum at their own pace; others feature a cohort learning approach where groups of students cycle through the program together. Cohorts enjoy a sense of community and usually finish the program together at a predetermined time. If your program requires you to complete an internship or become a licensed counselor, you'll likely take longer to finish. On average, it takes 1-3 years and anywhere from 33 to 60 credits to complete an online master's in addiction and recovery. Make sure to choose an accredited program when you're looking for an addiction and recovery master's degree online. Accreditation is process of evaluation that schools voluntarily undergo to make sure they meet a certain standard of educational quality. Two types of accreditation exist: regional and national. Regional accreditation organizations focus on geographic areas of the U.S., whereas national accreditation agencies accredit schools throughout the country. The more widely recognized type of accreditation is regional accreditation. Transfer credit from regionally accredited schools is also more widely recognized and accepted than credit from nationally accredited schools. Choosing an accredited school is a good way to ensure you get a high quality education. Council for Accreditation of Counseling & Related Educational Programs (CACREP) accredits master's and doctoral degree programs in counseling and its specialties. National Addiction Studies Accreditation Commission (NASAC) accredits higher education addiction studies programs. Students should also determine if the online master's degree in addiction and recovery programs they are interested in are accredited by an industry-specific or state-specific organization. Some states require that addiction counselors become licensed and feature state organizations that accredit addiction degree programs. Two organizations that play major roles in accreditation are the U.S. Department of Education (DOE) and the Council for Higher Education Accreditation (CHEA). In addition to establishing educational policy, the DOE coordinates federal assistance and distributes student loans and grants. The DOE also publishes a list of nationally recognized accreditors that students can trust. CHEA is an group of colleges and universities that coordinates the accreditation process for higher education in the U.S. by ensuring that the accrediting agencies themselves meet certain quality standards. Visit the website for the Department of Education or the Council for Higher Education Accreditation for a list of accredited schools. In addition to geographic location, type of career, and professional experience level, the kind of employer you work for will impact your annual earnings in the addiction and recovery field. The table below features data from the Bureau of Labor Statistics regarding expected salaries for substance abuse and behavioral disorder counselors working for different types of employers. An addiction counseling master's degree online prepares graduates to work in the fields of direct client/patient services, public health, human services, social and community services, research, and education. Addiction and recovery professionals work in nonprofits, hospitals, outpatient clinics, private practices, and at all levels of government organizations. The most common career path in the field is substance abuse/addiction counselor. A position in the addiction and recovery field is well-suited for those interested in helping people improve their health. Additionally, a calm and empathetic disposition, especially under stress, is a helpful personality trait for professionals in this field. These counselors provide treatment to people struggling with various addictive behaviors, from alcoholism and drug addiction to eating disorders. Professionals with an advanced degree in this role are poised to earn more than those with only a bachelor's degree. Managers of social and community services coordinate and supervise community organizations and social services, including addiction and recovery services. They usually manage staff members who provide these services directly to individuals. A bachelor's degree is needed for entry-level positions, but it's helpful to have a master's degree for career advancement. These therapists help people battling problems with their marriage, family, and/or mental health issues, which sometimes includes addiction. They typically need a master's degree and a license in order to practice. Social workers assist people with problems in their everyday lives. Clinical social workers diagnose and treat mental, behavioral, and emotional issues, which may include addictive behavior. A bachelor's degree is usually required for entry-level positions, but a master's will enable individuals to qualify for higher positions. These professionals teach others how to improve their health as individuals and communities. They develop, implement, and evaluate programs to promote community health, including programs dealing with addiction. An advanced degree will make job candidates more competitive and allow them to earn a higher salary. Master Addiction Counselor (MAC): This voluntary certification demonstrates skills learned through graduate coursework or work experience. MACs can advance their careers and earn higher salaries. Applicants must have a master's degree in addiction studies, a current professional counseling license, three years of full-time experience, and 500 hours of education. Additionally, candidates must pass the certification exam within four years of application. National Certified Addiction Counselor I (NCAC I): A voluntary certification similar to the MAC, the NCAC I is for those working in the addiction/substance abuse field and may lead to career advancement and higher salary. The credential indicates specialized knowledge in addiction assessment and treatment. Applicants must be currently licensed addiction counselors, have 270 hours of education, and pass the certification exam within four years of applying. Joining professional organizations in the field of addiction and recovery is beneficial to both current students and recent graduates. Membership in industry groups is good way to connect with future colleagues and employers; learn about job, volunteer, and committee opportunities; and stay informed about new developments in addiction and recovery studies. Most professional organizations offer discounted membership rates for students and recent graduates. This group represents addiction counselors, educators, and other healthcare professionals focused on addiction. NAADAC features 47 state affiliates that work together to foster healthier communities through prevention and treatment of addiction. This nonprofit organization provides its members with clinical and operational resources relating to addiction issues. One of the organization's main goals is to disseminate information on industry-wide best practices. This professional society represents physicians, clinicians, and other professionals in the field of addiction medicine. ASAM educates doctors and the public, supports research, and is dedicated to improving the qualify of addiction treatment. Paying for your degree can seem daunting. Luckily, there are numerous options for funding your education. Everyone should complete a Free Application for Federal Student Aid (FAFSA) form in order to understand federal funding opportunities like scholarships, loans, grants, and work-study. Numerous scholarships and grants are also available through private individuals and organizations. Those who already work for a substance abuse or addiction-related organization should find out if their employer offers tuition assistance for employees seeking further education in the addiction and recovery field.